Abstract: This episode is the second part of the lost recordings. I talk about the songs and short films ‘Scream’, and ‘You Rock My World’. Taking in consideration the cultural context and the symbolism of the visuals of ‘Scream’ and ‘You Rock My World’. Merx, Karin. “Episode 33 – Part 2 of The Lost Recordings ‘Scream’ & ‘You Rock My World’, ” Michael Jackson’s Dream Lives On: An Academic Conversation 5, no. 1 (2017). Published electronically 21/12/17. http://michaeljacksonstudies.org/episode-33/. 2. Elizabeth Amisu, The Dangerous Philosophies of Michael Jackson: His Music, His Persona, and His Artistic Afterlife (Praeger, 2016). 3. Michael Jackson, Scream (1995). 5. 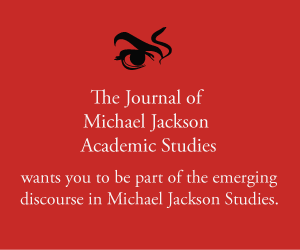 Karin Merx, ‘Academic Book Review of The Dangerous Philosophies of Michael Jackson, His Music, His Persona, and His Artistic Afterlife’, The Journal of Michael Jackson Academic Studies, 5 no. 1 (2017). by Elizabeth Amisu. 6. Karin Merx, The Visual Art of Michael Jackson, onlineartseducation.co.uk (2016).